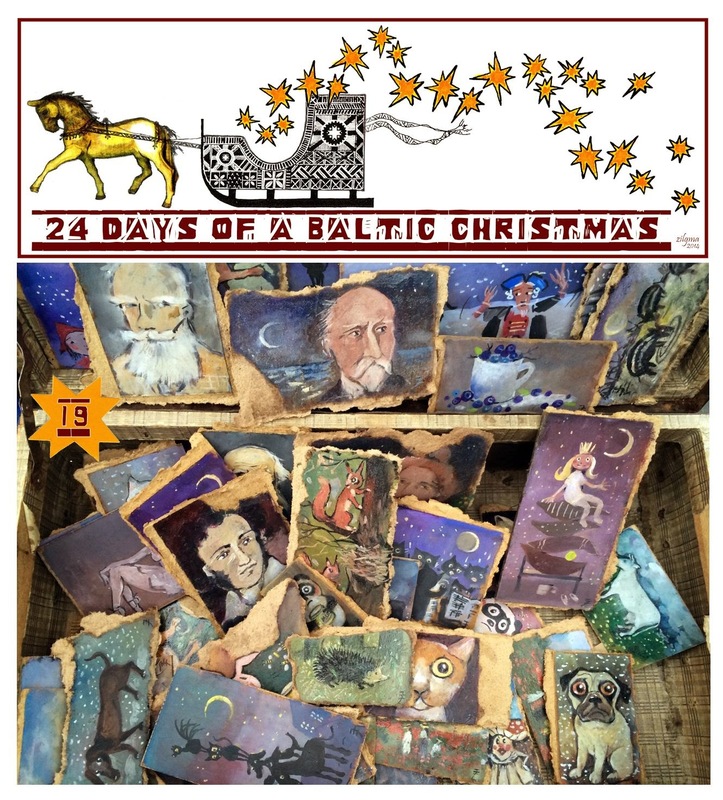 Day Nineteen of 24 Days of a Baltic Christmas is from Marianna of Hello, Latvia. Marianna been slowly going native in the "motherland" Latvia for the last 10 years, after growing up in sub-tropical Brisvegas, Australia ... analysing the differences, advantages, life styles in both places. 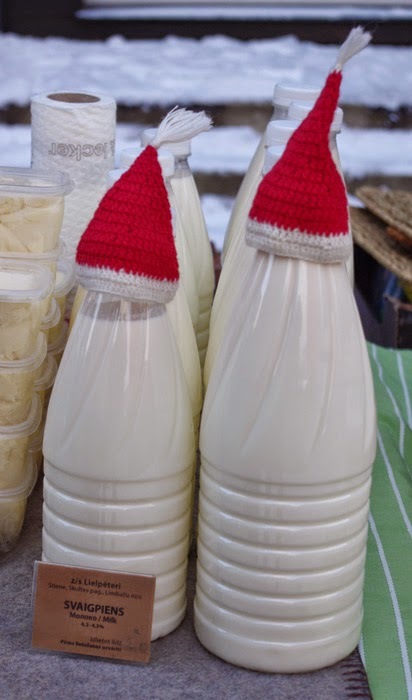 Christmas in Latvia (or I assume, in Europe) would not be complete without visiting a Christmas market. In Rīga this usually means trotting off in sub-zero temps to the old town, where the wooden booths set up in the dome square display the same wares they have been selling since, oh, the middle ages. Well, at least since the 1980s. Leather wallets and book covers, beeswax candles, home-knitted goods, some Lithuanian-made wooden toys, big gingerbread hearts with fancy icing. Mostly nice things - but kind of boring, if you are shopping there for the fifth year in a row. And desperately cold, when you take off your gloves to pay for something. This is why I feel relieved and pleased in the last few years, that an „alternative” Christmas market has developed at Kalnciema Street, just down the road from our place in Pārdaugava. Around Christmas, our regular local craft market goes ballistic. There are so many stalls they overflow out of the yard and onto the sidewalk, and people come in droves to buy locally made food and craft in anticipation of the festive season. 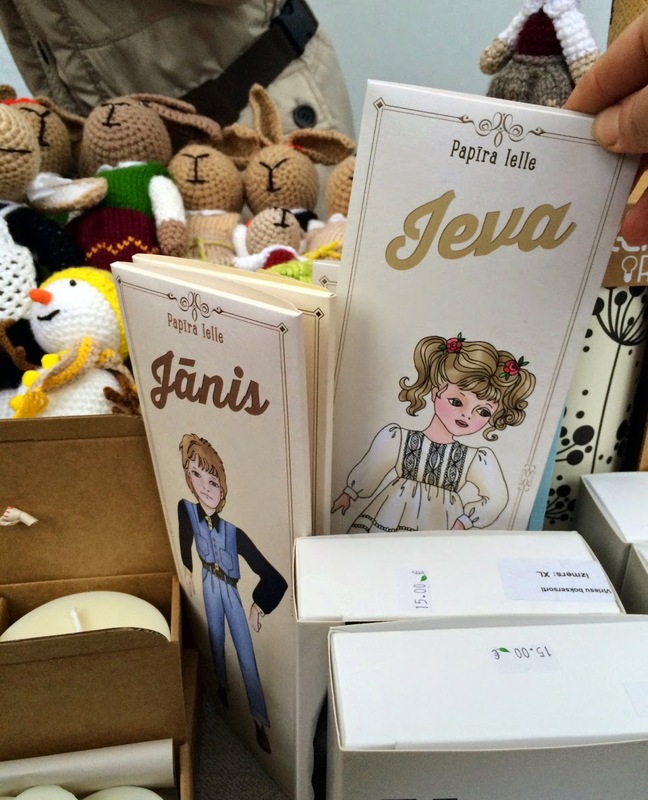 Paper dolls named „Jānis” and „Ieva” - no more Jack and Jane for us. Hemp seed products – products derived from traditional Latvian hemp butter – hemp seed pesto, hemp oil soap, different flavors and consistencies of hemp butter, raw hemp seeds. 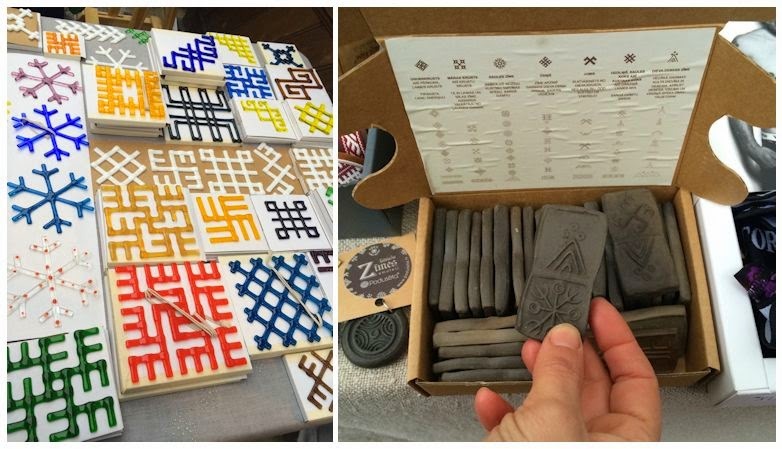 Products based on Latvian ancient symbols – scarves, hats, wooden ornaments, glass decorative items, candles, children’s toys like domino, jewelry, reflective brooches, all sporting ancient Latvian symbols. Old standard symbols like Saulītes (the sun) and Auseklīši (the morning star) are no longer popular, giving way to the austras koks (tree of dawn) and ornate variations of the pērkoņkrusts (thunder god). Great to see the old symbols being wholly embraced and incorporated into contemporary designs. 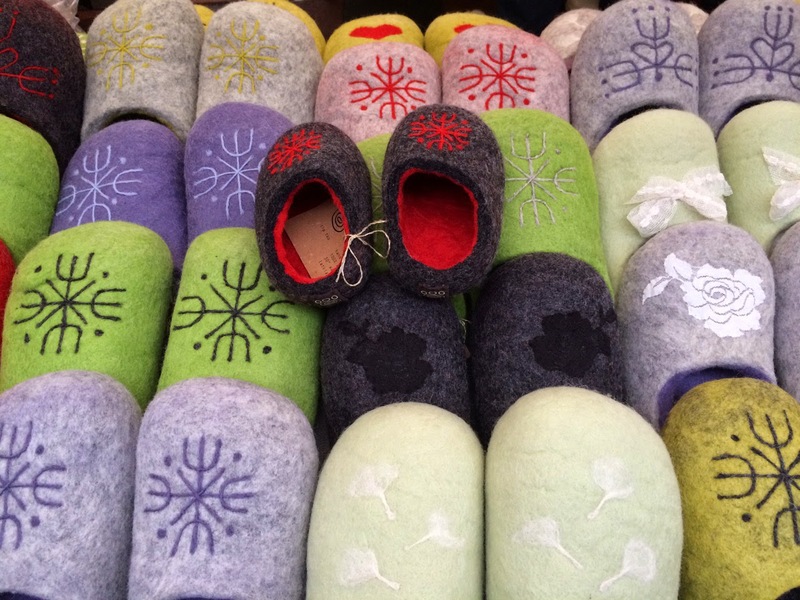 Half of Latvia has lived and worked in Norway in the last ten years, I guess this might explain the locally-made troll-child felted clogs. That I want. If your kids are bored with shopping, they can catch a bit of culture in the wine store. 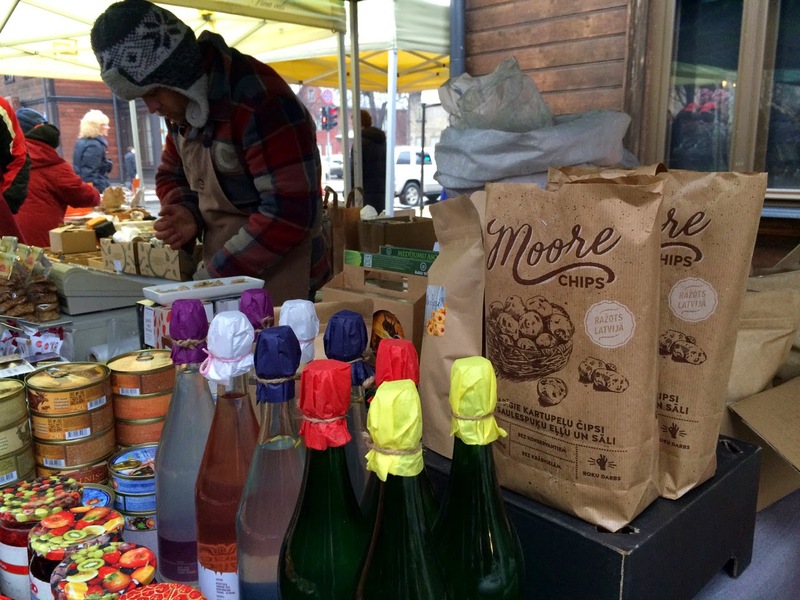 Lately, perplexingly, there has been a rush of local alcohol brewers/manufacturers – Latvian-made wine, moonshine, apple cider, fermented birch juice... every friendly vendor willing to have a chat and give you a sample. Can’t say I’m a fan of the wine, but moonshine... now Latvians REALLy know how to make good moonshine! Raw milk! In these parts we all drink raw milk. Most people think it’s the healthiest thing for their children and families. No big deal. Even at Christmas. 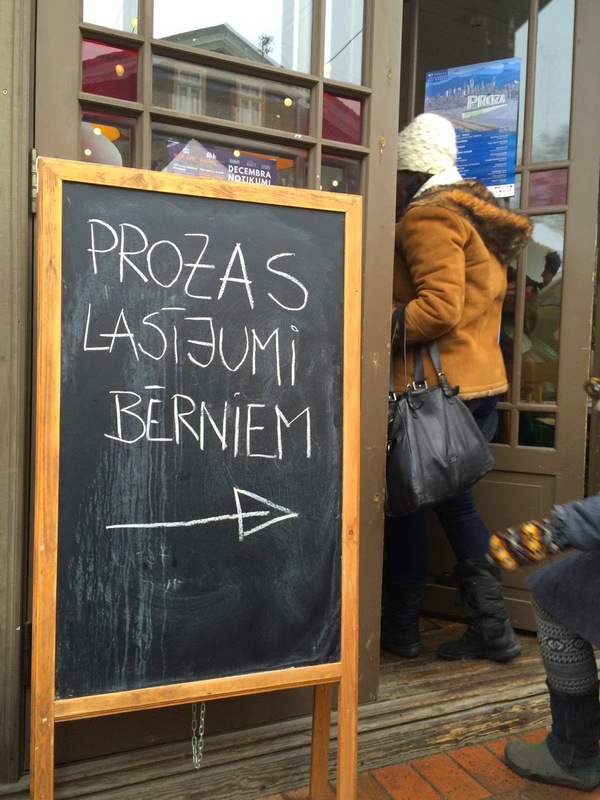 Of all the stalls at the Kalnciema Christmas market, this one is my favourite, hands down. 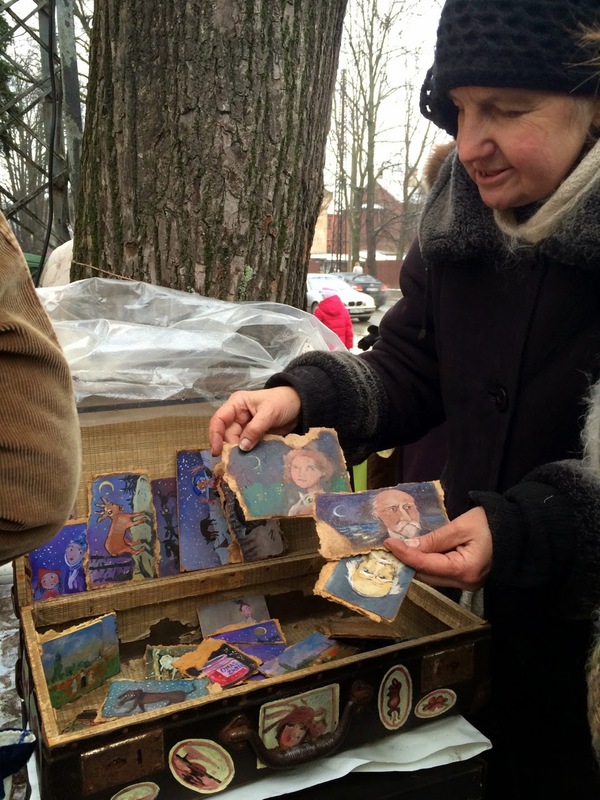 This lady and her vintage suitcase peddle small paintings, on ripped offcuts of particle board. Trained at the Latvian Academy of Art, this lady’s work reveal kitsch worlds featuring all manner of Latvian portraits and still-lifes. For two or three euros you can obtain your very own miniature Rainis in the moonlight, or Barona tēvs looking stern, or Aspāzija the crazy cat lady. Or a still life of a famous Latvian icon – a jar of pickles, or a jar of grandma’s jam. Kitsch and curious, but charming nonetheless. Thank you Marianna! I believe any one of these items would be welcome under our Christmas tree! And thank you Jeremy Smedes, for the beautiful photographs! Tomorrow on 24Days of a Baltic Christmas will be Nomeda Lukoševičienė and her beautiful cards made with pressed flowers. How fantastic! Thanks, Marianna & Jeremy! 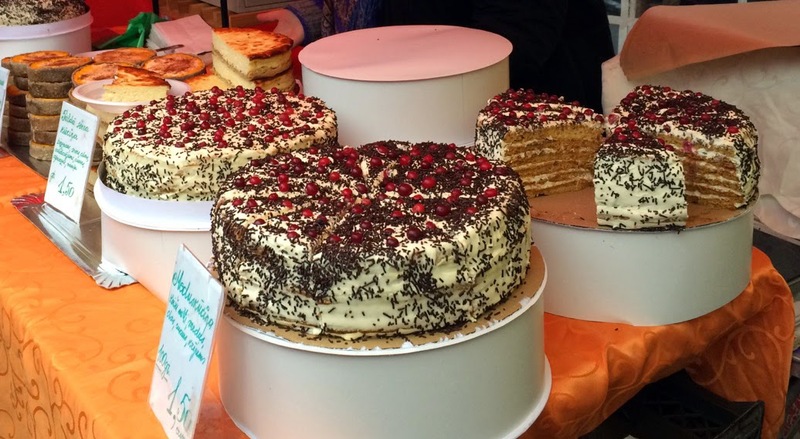 One of my regrets from the week spent in Riga earlier this year was not being able to make it to the Kalnciema iela market, as I've heard so many good thing about it. Those little paintings of Aspazija, Rainis, Latvian nature scenes, etc are just awesome -- I think I need one of each!